Update 31 Aug 2010: Check Updated Tweet Old Post for latest changes. Tweet Old Posts is a plugin designed to tweet your older posts to get more traffic. Tweet Old Posts randomly picks your older post based on the interval specified by you. The primary function of this plugin is to promote older blog posts by tweeting about them and getting more traffic. Click on Tweet Old Post to download the plugin. 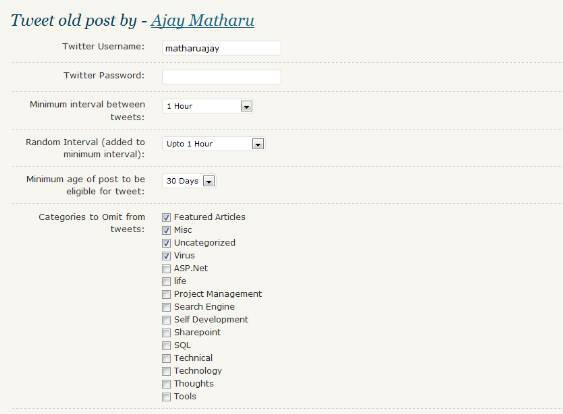 Following are the steps to install the Tweet Old Post plugin 1. Download the latest version of the Tweet Old Posts Plugin to your computer from here. 2. With an FTP program, access your site’s server. 3. Upload (copy) the Plugin file(s) or folder to the /wp-content/plugins folder. 4. In your WordPress Administration Panels, click on Plugins from the menu. 5. You should see Tweet Old Posts Plugin listed. If not, with your FTP program, check the folder to see if it is installed. If it isn’t, upload the file(s) again. If it is, delete the files and upload them again. 6. To turn the Tweet Old Posts Plugin on, click Activate. 7. Check your Administration Panels or WordPress blog to see if the Plugin is working. 8. You can change the plugin options from Tweet Old Posts under settings menu. Alternatively you can also follow the following steps to install the Tweet Old Post plugin 1. In your WordPress Administration Panels, click on Add New option under Plugins from the menu. 2. Click on upload at the top. 3. Browse the location and select the Tweet Old Post Plugin and click install now. 4. To turn the Tweet Old Posts Plugin on, click Activate. 5. Check your Administration Panels or WordPress blog to see if the Plugin is working. 6. You can change the plugin options from Tweet Old Posts under settings menu. 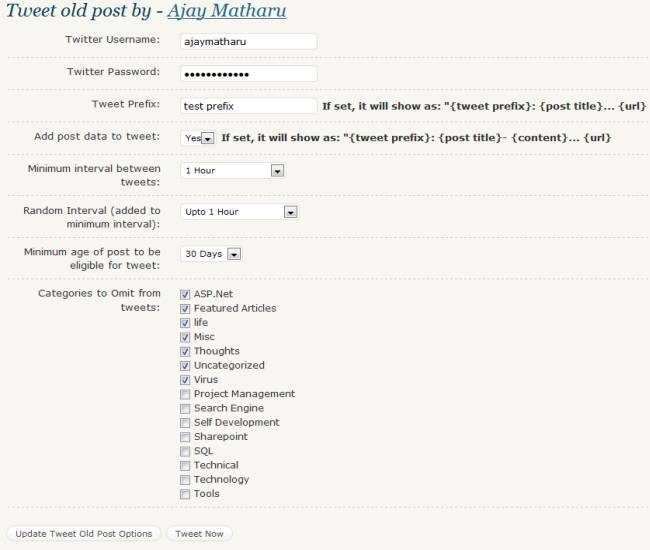 Some of the options you can configure for the Tweet Old Posts plugins are, Twitter Username & Password – Using this twitter account credentials plugin will tweet. Minimum interval between tweets – allows you to determine how often the plugin will automatically choose and tweet a blog post for you. Randomness interval – This is a contributing factor in minimum interval so that posts are randomly chosen and tweeted from your blog. Minimum age of post to be eligible for tweet – This allows you to set how old your post should be in order to be eligible for the tweet. Categories to omit from tweets – This will protect posts from the selected categories from being tweeted. Download Download Tweet Old Post plugin – current version 1.0 Let me know if you have any suggestions or comments or critics for this. Changelog – v1.2 changed Dec 8th, 2009 Added two more options and one action button, Tweet Prefix – Allows you to set prefix to the tweets. Add Data – Allows you to set if you need to add post data to the tweets. Tweet now – Button that will tweet at that moment without wanting you to wait for scheduled tweet. Let me know if you have any suggestions or comments or critics for this. v1.3 changed Dec 12th, 2009 URL Shortener Service – Allows you to choose URL shortener service from some of the predefined ones. v1.4 changed Dec 27th, 2009 Hashtags – allows you to set default hashtags for your tweets. v1.5 changed Feb 14th, 2010 Maximum age of post to be eligible for tweet – allows you to set Maximum age of the post to be eligible for tweet Added one more shortner service was looking for j.mp but they dont have the api yet. v1.6 changed Mar 24th, 2010 – Made the plugin PHP 4 compatible. Guys try it out and please let me know if that worked. – Better error prompting. If your tweets are not appearing on twitter. Try “Tweet Now” button you’ll see if there is any problem in tweeting. – Added 1click.at shortning service you need to get the api key from http://theeasyapi.com/ you need to add your machine IP address in the server of http://theeasyapi.com/ for this api key to work.